MetaCOT 2 is a set of indicators and specialized utilities for the analysis of the U.S. Commodity Futures Trading Commission reports. Thanks to the reports issued by the Commission, it is possible to analyze the size and direction of the positions of the major market participants, which brings the long-term price prediction accuracy to a new higher-quality level, inaccessible to most traders. These indicators, related to the fundamental analysis, can also be used as an effective long-term filter when entering a medium-term position. For this they should be combined with a classic price analysis. The MetaCOT series indicators are based on the book by Larry Williams "Trade Stocks and Commodities with the Insiders: Secrets of the COT Report". 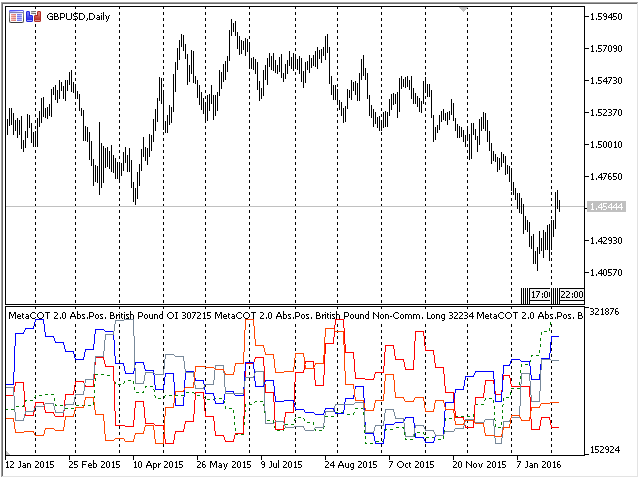 The operation of these indicators is further described in the article Meta COT Project - New Horizons for CFTC Report Analysis in MetaTrader 4. This utility downloads and automatically updates the reports submitted by the Commission, saves them to a special database, which is used in the operation of the MetaCOT 2 series indicators. The entire download and installation process is automatic, which greatly simplifies the work with these data types in the MetaTrader terminals. For successful operation of the MetaCOT 2 Install CFTC Reports utility, the EAs should be granted access to the Commission's site. 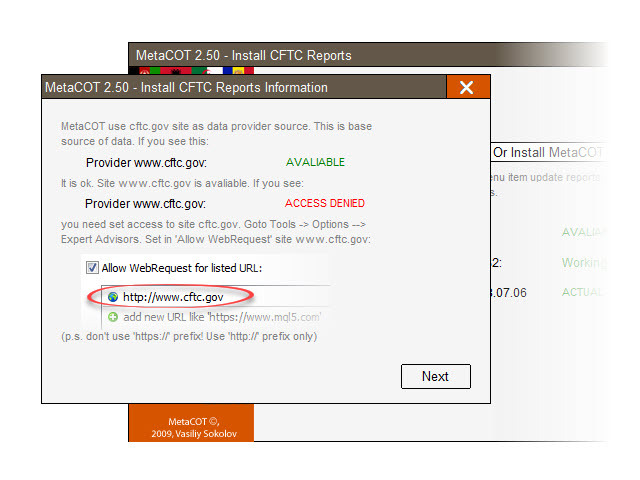 Allow the WebRequest to the http://www.cftc.gov site in the Tools --> Options --> "Expert Advisors" tab. - исправлена ошибка установления связи с сервером, возникающая при работе с протоколов https. - Added function of downloading reports from local sources. Now, if the tool cannot connect to a remote server, it tries to download necessary files from the hard disk of the computer. - Added support for third-party utility for downloading reports. Now reports can be downloaded by a third-party Windows application (optional). This solves the problem of connection failure, which can occur on Windows 7 and younger systems, because the required TLC 1.2 protocol may not be used by default. - New additional indicators now show the status of the connection and the database. These indications can help detect possible failures and errors. - The interface of the panel has been redesigned: interactivity has been added (buttons and drop-down list are highlighted when you hover the mouse), the behavior of standard graphic elements has been improved, the main elements have been re-arranged. The panel interface became more contrast. - The panel now contains Help in the form of sequentially opening windows. Each window describes various situations and errors, which can occur when using the panel, and how to fix them. Now any unusual situation can be easily dealt with. - The previous version of the panel did not react to clicking its buttons or drop-down list for some users. The bug has been fixed. 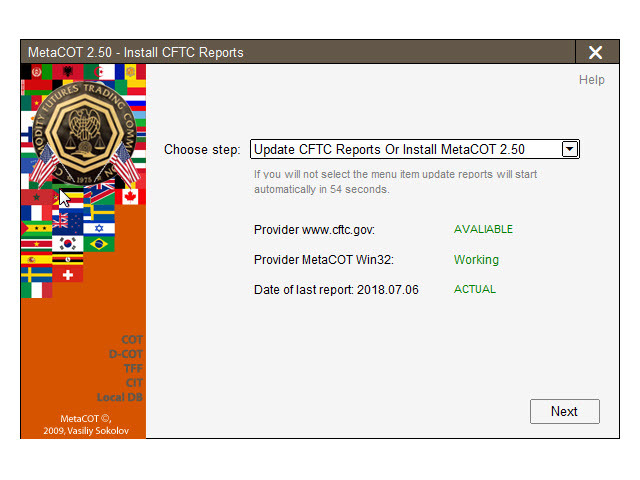 - From the current version on the panel starts with a preset action in the available action list: "Update CFTC Reports Or Install MetaCOT". - Now the report download starts automatically 60 after the panel is launched, if the user did not select any of the available actions and did not press the "Next" button. - The changes described above now allow to simplify the setup process even more, making it fully automated (the panel starts downloading the reports itself after a certain time, without waiting for an explicit command from the user). - Fixed installer warning messages, now the reasons of some errors are more clear to users.